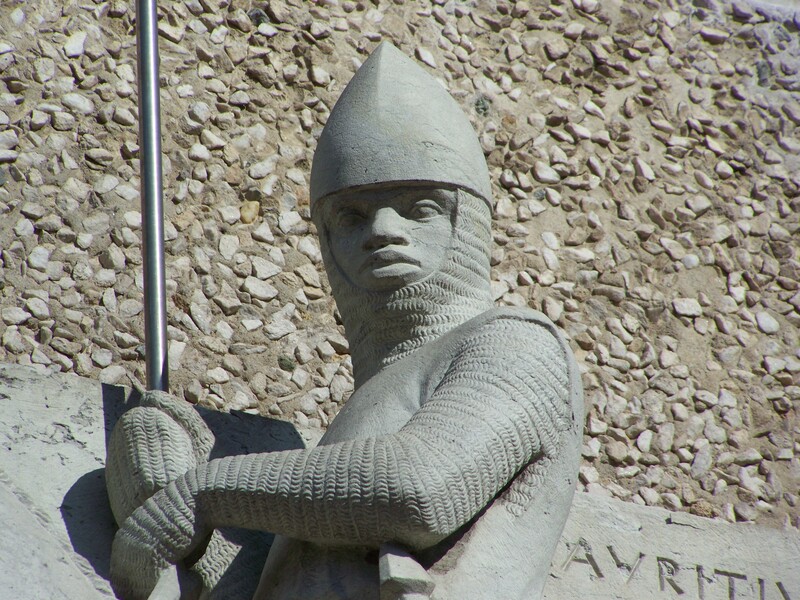 In the thirteenth century Magdeburg’s patron saint, St. Maurice, began to be depicted as a black man, and this became part of a tradition in the region that continues into the present-day. In 1987, the East German government undertook an ambitious residential development (known as “Brunos Warte”) in the historic city center of the nearby city of Halle (Saale). This project, built in the most modern materials, integrated housing with shops and gardens and adorned the area with impressive artistic projects. One of the works is a statue by Christoph Weihe that depicts St. Maurice carrying his spear and mounted on a horse. This complex is located next to Mright around the corner from Halle’s Moritzkirche, a late Gothic church dedicated to Magdeburg’s patron saint. Source: Christoph Weihe, St. Mauritius (Halle, 1987). Image courtesy of Martin Beitz (Halle im Bild). ©Martin Beitz. St. Maurice in East Germany (1987) by Jeff Bowersox is licensed under a Creative Commons Attribution-ShareAlike 4.0 International License.